My friend Sara, greeted guests at the door and then served red and white wine along with iced tea, bottled water and a variety of sodas. She also set up a table near the door with the party favors, a Wishing Jar (for words of wisdom for the bride) and little potpourri sachets she made. This was such a cute way of dressing up the favors. 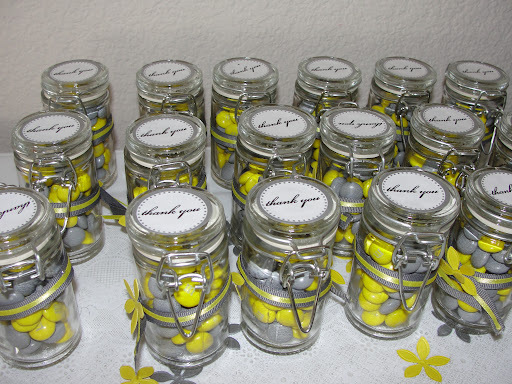 Yellow and Gray M&M’s with some scrap book flowers hot glued to our colors of the wedding ribbon along with Thank You stickers. I’m thinking about doing this for a baby shower soon also. And yes, it was a vegetarian delight bridal shower. The only thing I didn’t eat was quiche however ever thing else she made vegan for me. I LOVED IT!!! and so did the guests! This was my favorite part of the food. She made sandwiches and then used a heart cookie cutter to cute them out. It was the little touches like this for the bridal shower that blew everyone away. And she did all of this by herself the morning of! WOW! And when you first walked in the door, you see all the balloons on the ceiling and couldn’t help but smile and get in the spirit of celebration. And to top it off, she brought in a massage therapist for all the guests to relax, let go of their day and BE HERE for me. This so over the top, I couldn’t believe it!! I am so fortunate to have someone like her in my life and to have such a big heart to do something like for me. Especially during our school year, this was like a mini vacation to remember what is important and bring us all back down to our hearts and out of our heads.